A few days ago I received the galvo kit and tonight the laser arrived with a USB sound card and my new soldering iron. So I’ve decided to give a try and check if I could make the thing move. With a signal generator I tried to draw lines as I could only drive one channel at a time. The lasers worked between 3 to 5V as advertised and the luminosity is somehow decreasing until 2.5V. It will probably be relatively easy to do a blanking mechanism, but controlling the power might be tricky. Also the first lesson was theses beasts are very sensitive, as I fried one without any real obvious mistakes… First conclusion: I will order some cheap heads to tune everything before switching to the small spot laser. Here are some boring single axis tests, changing the frequency makes the spot appears as a continuous line or a moving dot. 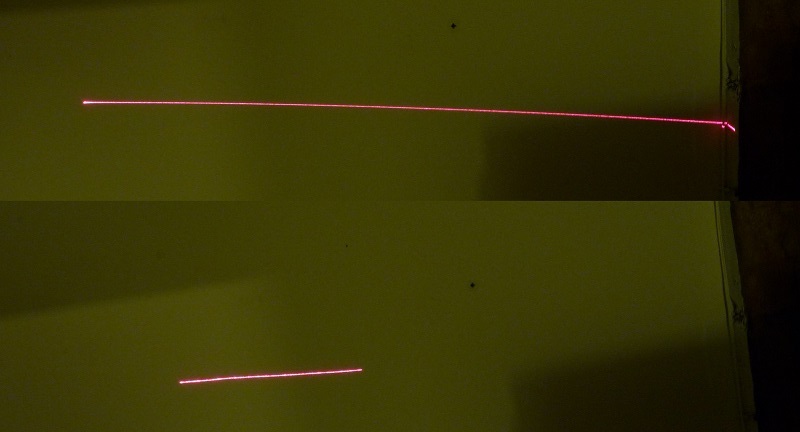 Also I’ve tried to see how fine the beam could be focused at a 50cm distance. I’m quite satisfied to see that if everything goes right, the line could be around 1/2 mm wide. This picture was taken with a flash, so most of the speckle is gone. 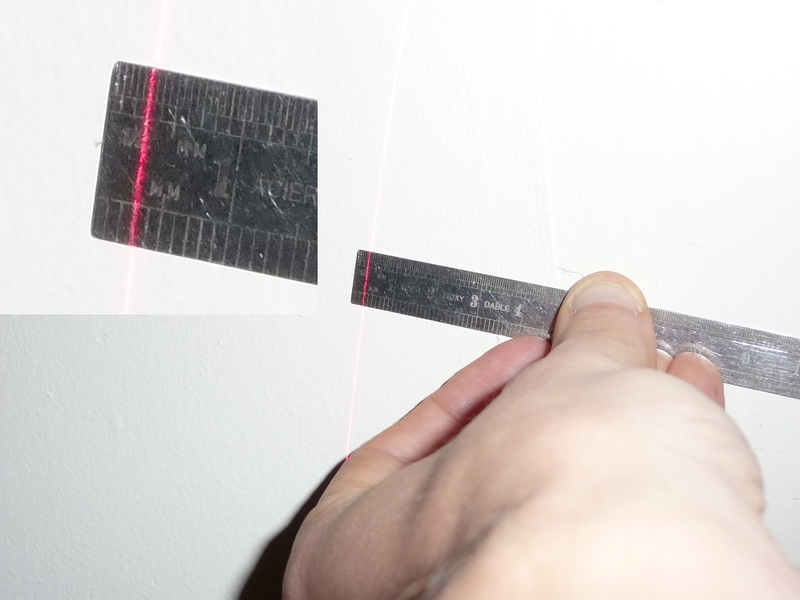 The apparent width of the beam with naked eye is much larger. That probably mean I will have to find a filter to put in from of the webcam. Anyway I think the next step for this weekend is to build a Sound-card to galvo driver adapter to be able to draw some figures! This entry was posted in 3D Scanner, galvo / laser scanner and tagged 3D scanner, galvo, laser, laser shows on March 22, 2013 by damienideas.